Exporting patented technology is a desirable business strategy in the competitive global market. Just ask Pacific Ozone Technology, Inc. This California company creates “customers for life” through the manufacture and sale of ozone generators and ozone test kits. 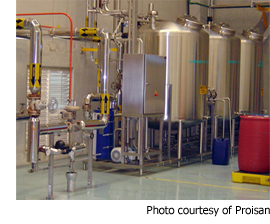 Its O3-CIP technology can improve the efficacy and efficiency of companies’ plant sanitization systems. It can reduce overhead costs by minimizing the time for cleaning cycles; lowering energy use without the need for hot water; and reducing water use through recycling and fewer rinses. The company often relied on pre-payment from their foreign customers for purchases. This limited quantity sold to existing customers and reduced its ability to enter new markets. Buyers wanted “open account” credit terms and Pacific Ozone was wary of the risk of going beyond net 30 day payment terms. EXIM minimized the risk of nonpayment and provided the company with the confidence to extend longer credit terms. Today the company exports to approximately 15 countries and exports contribute to about 45% of the company’s total sales. EXIM’s support of $3.1 million of exports from 2013 to 2018 have also contributed to sustaining two U.S. export-related jobs.